The use of bullhooks by circuses traveling through Oakland will continue, but according to some opponents of the fire poker-like implement used to control elephants, the end may be near. On Tuesday night, the city council unanimously approved an ordinance authored by Councilmember Libby Schaaf that places stronger regulations on the safety of spectators at circus performances in Oakland and rules ensuring the greater care of the animals. Until Tuesday night’s decision, the city lacked a specific ordinance regarding either issue. The new ordinance is similar to regulations passed in San Jose, Sacramento, and Los Angeles. Animal rights advocates and the Oakland Zoo applauded the new rules, but many public speakers and a few council members continued a push to ban the bullhook from Oakland. “This is a vital first step in acknowledging that animals used for entertainment need protection,” said Christy Griffin representing the animal rights group, In Defense of Animals. 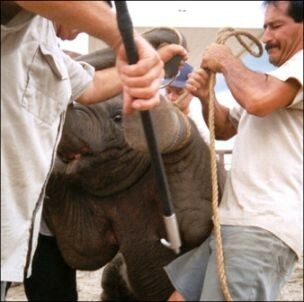 “I also urge you to pursue stricter measures to ban all animals or enact a bullhook ban. Thomas Albert, vice president of government relations for Feld Entertainment, assured the council the circus already is in compliance with various animal safety regulations and passed inspections last year in Oakland conducted by the federal authorities. However, despite threats by Feld Entertainment to stop coming to Oakland if a bullhook ban is enacted, there are clear signs the city council will take up the more stringent regulation sometime in the next eighteen months. Councilmember Dan Kalb, another supporter of the ban, agreed. “This is an important first step, not the end step,” he said. “Sometimes things need a little more time to happen. I think sometime down the road we will take those next steps and this sets the table for doing that.” An amendment added by Kalb, in fact, calls the city administrator’s office to provide a biannual report starting in June 2015 on permitting process with further possible protections for animals, including “options that mirrors the implements ban proposed by the Los Angeles City Council.“ Last October, Los Angeles approved a bullhook ban set to begin in three years. Another amendment to Oakland's new regulations prohibits any delays of longer than 30 minutes for the inspection of animals. A bullhooks ban, however, may include financial risks to the Coliseum’s bottom line, said Councilmember Desley Brooks. The week-long circus is not the only act Feld Entertainment brings to the Coliseum. Disney on Ice and various monster truck exhibitions also attract large crowds to both Coliseum facilities. Schaaf, though, said Tuesday that Feld Entertainment had told her that while a bullhook ban would effectively ban the circus in Oakland, the company would not pull its other entertainment properties out of the city. “That is the assurance they gave me,” said Schaaf.